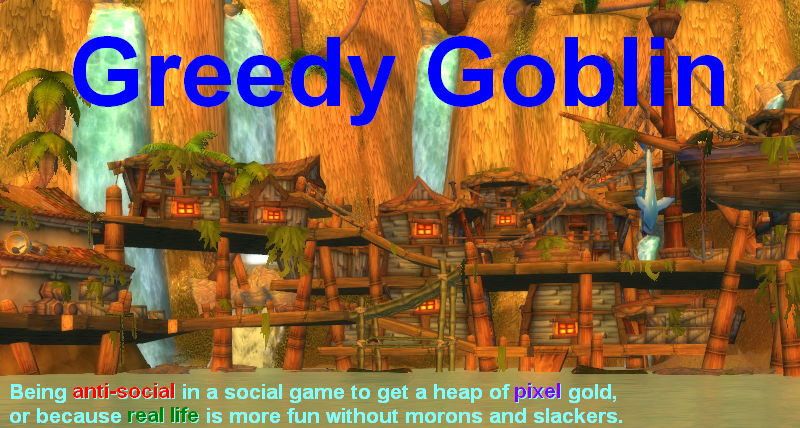 Greedy goblin: Weekend minipost: nerf war costs! Weekend minipost: nerf war costs! Damn war costs are high! There should really be a pay for 2, get 3 discount: Yes, that's almost 8B/week, which is about a well fit supercarrier a month. However the results are about two titans worth of kills, even in a bad month. Who wouldn't trade a mothership for two titans? The zero fields refer to no funded wars. If you want to make difference, you can sponsor any of them. 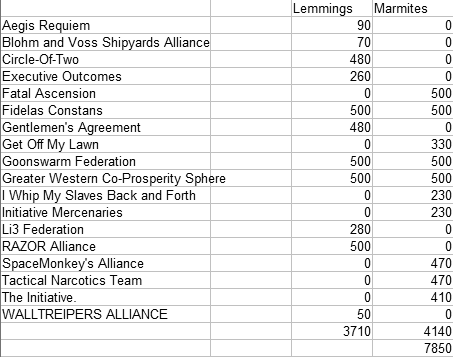 Contact General Lemming if you want to fund a Lemming war and Tora Bushido if you want Marmites to kill the evil ones. You can make difference in EVE, maybe your few hundred million ISK will enable a beauty like this, this, these, this or even this! Be the buttefly whose wingflaps create a storm that cleanse griefing, tribalism and "meta-gaming" from New Eden! Join the holy crusade against those who want to destroy our game! As long as they have members, they worth deccing. To even consider contributing i'd need to see some concrete proof that it's effective. Killmails are fine, but they only show that they are getting some losses, not that it's having a long term effect on their running. What can you show us that can make us believe that this will actually cleanse this group from the game? You should use your influence as patron and have Lemmings rolled into Marmite so you can save 1.5 billion in costs. I'm sure that both sides would enjoy the much bigger target pool as well. Marmite is a general wardeccer. They dec CFC because I pay them, but also dec N3 renters and anything that moves. Lemmings are much more focused. At the end of the day, the only thing going away is your ISK. None of these organizations will go away due to your paying for war dec fees. So you kill some noobs or idiots...thats it.